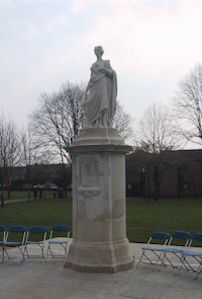 Beeston is unusual - almost unique - with having three outdoor war memorials, which remember the dead of four wars - the Crimean War memorial in the churchyard, the Boar War memorial now in Broadgate Recreation Ground and the memorial to the fallen in the two World Wars which is on Middle Street opposite the bottom of Church Street. 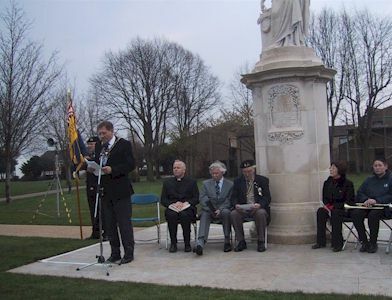 We are continuing to work on a large amount of information about the three memorials that we have gathered, and hope to publish here later in 2007. 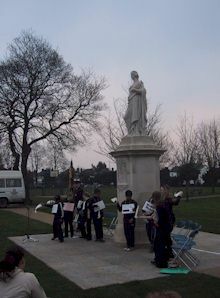 However, on 31 March 2007, the Boar War memorial was rededicated at a new location on Broadgate Recreation Ground, so it is fitting, in the meantime, to include photographs taken at that time. Private William Taft, killed at Battle of Roodewal (Rhenoster River) on 7 June 1900 - apparently the son of William and Ellen Taft who was born in July 1884. This means that, at about 16, he was probably the youngest of the five men who died. 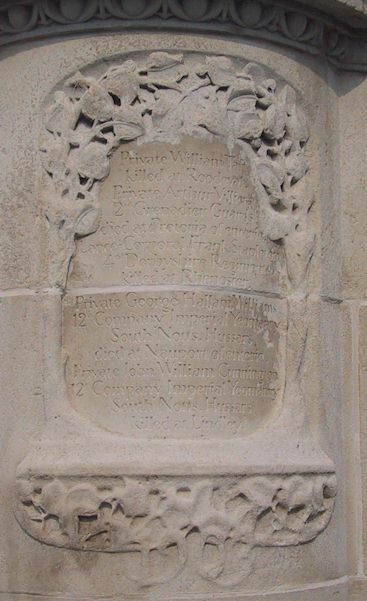 Private Arthur Villiers, of 2nd Grenadier Guards, died on 7 July 1900 of enteric fever, at Pretoria where he is buried, - nothing further is known about this man. Lance-Corporal Frank Stapleton, of 4th Derbyshire Regiment, killed in action on 7 June 1900 at Rhenoster River - was born in 1880 in Stapleford, Notts to Charles, then a railway labourer, and Hannah. He would have been about 20 at the time he was killed. His mother died when he was seven and his father then married Eliza Peberdy in 1890 and had become a farm bailiff on Middle Street, Beeston by the time of his son's death. 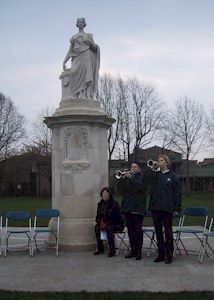 Private George Hallam Williams, of 12 Company Imperial Yeomanry, South Notts Hussars, died of enteric on 14 May 1901 at Noupoort ("Nauport" on the memorial) - was born in Beeston in 1879 so was about 21 when he died. His parents were George, a joiner, and Sarah Williams (née Clarke). Private John William Cunnington, of 12 Company Imperial Yeomanry, South Notts Hussars, died on 26 June 1900 of wounds received on 1 June 1900 at Lindley where he is buried - was born in Cropwell Butler, Notts in about 1879. one of four sons of John, a gardener, & Georgina Cunnington. I am indebted to Brian Kaighin for additional information relating to the place, date and circumstances of the death of these men. Brian specialises in aspects of the Boar War and maintains a comprehensive database of names.